How do I send email from an alias? Step 1) Sign in to your Google Apps email. Step 2) Click the 'gear' icon in the upper-right and select 'Settings' along the top of any page, and select the Accounts tab. 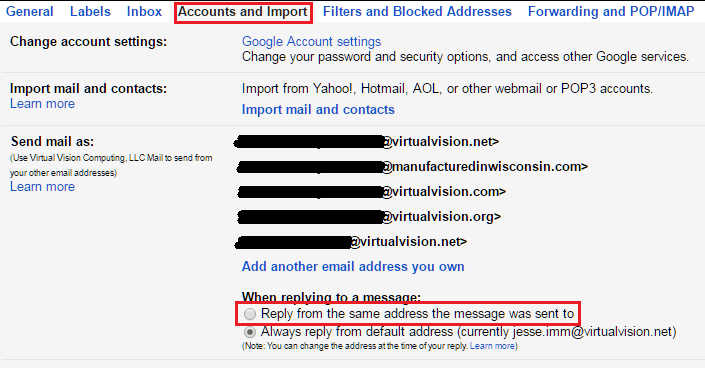 Step 3) Under Send mail as, click Add another email address. Step 4) In the Email address field, enter your name and alternate email address. Step 5) Click Next Step >> and then click Send Verification. Gmail will send a verification message to your other email address to confirm that you own it. Note: If the alias is within the same domain as your primary account this step may be ommitted. Step 6) Locate the message from Gmail. Open it and and either click the link contained in the message or enter the confirmation code in the Accounts section of your Google Apps email settings. Step 7) To use one of your alternate sender addresses, click the From link when you compose a new message. If you're replying to or forwarding a message, click the field where your recipients are listed, then click From. After clicking From, you'll see a drop-down menu next to your address, where you can select the email address you'd like to send from. Optional) You can automatically send from the same address a message was sent to by going to 'Settings' -> 'Accounts and Import'. Then click on the radio button next to 'Reply from the same address the message was sent to' under 'When replying to a message' in the 'Send mail as:' section as shown in the image below.